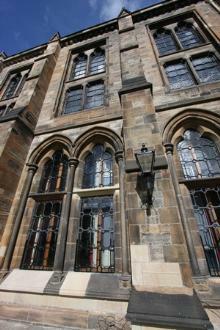 The main buildings at Glasgow University situated on Gilmourhill were largely designed by Sir George Gilbert Scott and constructed over a number of years in the latter half of the 19th Century. The Bute and Randolph Halls were completed after his death by John Oldrid Scott and Edwin Morgan, 1866-86, and the tower and spire added by John Oldrid Scott, 1887-1891. The external walls are constructed in local stone with Kenmure freestone dressings, with columns of red sandstone and pink granite. 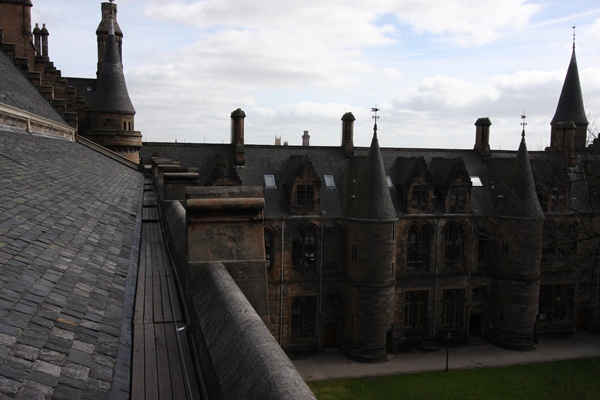 LTM were contracted by the University of Glasgow Estates department to carry out the Phase 10 Main Building external conservation works and which included indenting both defective plain and moulded stonework , repointing works , repair and replacement of slated roof slopes with all associated leadworks , timber flat gutter repairs and associated underlying structural support timbers , replacement of cast iron rainwater goods , repair and overhaul of cast iron windows , decoration works and renewing lightning protection systems. The project challenges centred around working in the midst of a working campus both operationally and in terms of health & safety and the potential for noise and disruption. 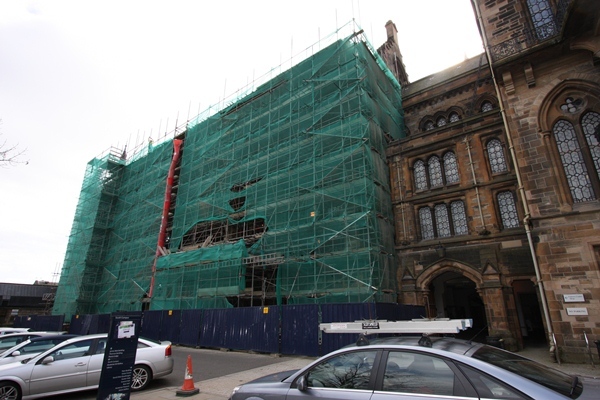 Preventing water ingress into the buildings, especially the Hunterian Museum given the extent of the proposed roof stripping and repair, was a further challenge given the importance of these areas and the artefacts within. A primary consideration was the historical importance of the Campus Main Buildings and the need for top quality, high-end conservation and repair work by LTM Group Ltd and those Sub Contractors entrusted with delivery on our behalf. With close attention to Health & Safety legislation and guidelines a workable site set-up and compound was established within the space designated and which was segregated from the public by stand-off fencing. By working closely with the University, we programmed noisy activities during periods where these would be least disruptive to the on-going functions of the University, with all material deliveries and vehicular site traffic being restricted to early mornings by arrangement. A temporary roof encapsulation was afforded to the building to prevent the possibility of water entering the structure due to its historic importance and the sensitive nature of the areas in question. Additional local protection was deployed at all roof areas opened up until such times as the replacement roof coverings and gutters were again in position and operational. All of LTM Group’s workforce are directly employed and for the most part trained in-house through the LTM Academy. This assists greatly with the control and retention of quality and the skills necessary to deliver works such as those required on Glasgow University. All Sub Contractors employed are seen as an extension of our quality and therefore are carefully vetted from a select group of Sub Contractors from each discipline required whom we can trust to deliver in terms of performance, quality and safety.